We are delighted to welcome you to the reopened BFI Library in its exciting brand-new purpose-built home in the heart of London’s cultural quarter, ahead of its formal launch in September. 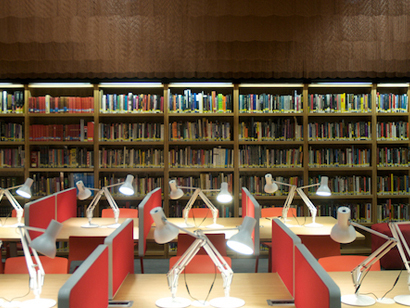 In just four months, the BFI Library has gone from design concept to a fully-realised modern library offering much greater access and free entry to one of the world’s leading centres of film and television knowledge. It also has a brand new Saturday service, regular longer weekday opening hours and increased digitisation of resources. The move to the former Gallery space at BFI Southbank allows the Library, for the first time, to develop a single and coherent creative vision across the venue, bringing together the whole BFI offer in one place – from the Mediatheque and programming, to Education and Collections. It also enables us to take full advantage of the huge benefits of opening in time for the busy 2012 summer with the Cultural Olympiad and the Olympics creating an unprecedented focus on the capital. Almost 30% more of the BFI collections are now accessible on open shelves in the new space and visitors can also access information on the collections from one central database. State of the art digital scanners will make it easier and quicker to carry out research as well as being more environmentally-friendly than traditional photocopiers. Among the first tranche of press cuttings to be made available digitally will be the entire Alfred Hitchcock collection – dating back to the 1930s when the Library originally opened and including up until 2010 – to support the BFI’s far-ranging Genius of Hitchcock Cultural Olympiad programme of restorations, screenings, talks and events. A core ambition of the digitisation programme is to make the entire press cuttings collection available as fully searchable digitised images by September 2012 to tie in with the official launch of the new Library. We thank all our users for their patience throughout the construction period and during the Library’s four-week closure and we look forward to seeing you in our new home very soon.